Uhh it says that Yvraine visarch yncanre is the warlord but that now the detachment counts as a proper drukhari craftworld or harlequin detachment and can use its relics strategems and warlrod traits. But if they are the warlrod and you can still use warlord traits, does that mean the they can have a warlrod trait from the appropriate codex of the detachment they are part of?? Like could a black heart Yvraine (OH THE IRONY) take the black heart warlord trait? Detachment even if you are using the Battle Brothers matched play rule. I really don't know to interpret this. 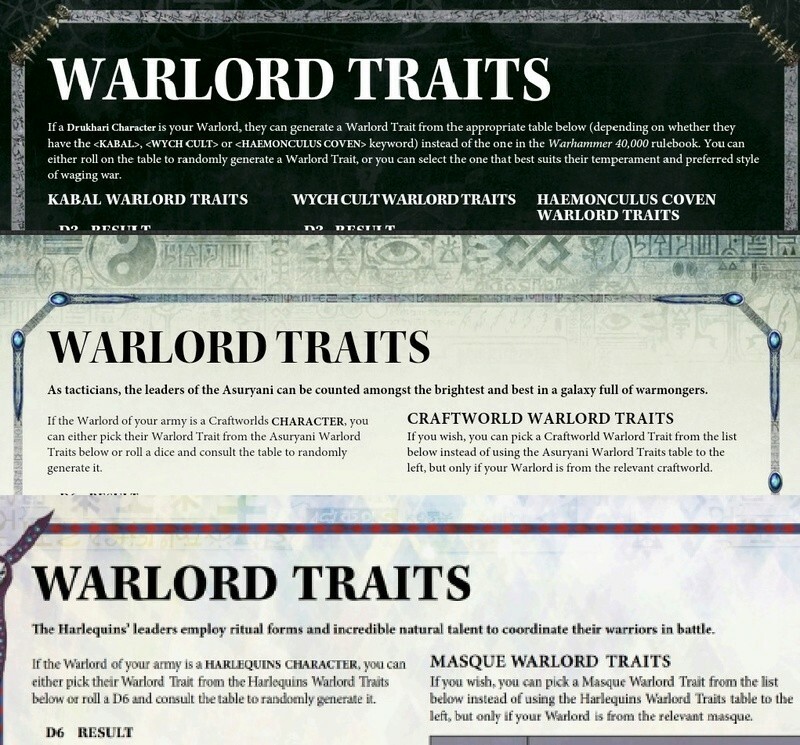 It looks like the FAQ does indeed say that Ynnari HQs can take Craftworld/Drukhari/Harlequin warlord traits, but there also aren't any specific Drukhari warlord traits (only Kabal, Cult and Coven ones), so...? TIME FOR ANOTHER FAQ !! No, they cannot take the Drukhari warlord traits, as Yvraine, Visarch and the Yncarne do not have Drukhari, Kabal, Wych Cult or Coven keywords. That said, if in that detachment you have, say, an Archon, you can give him the Drukhari artefacts. But Yvraine, Visarch and the Yncarne remain the same. If an Ynnari HQ is your warlord, you can take an Ynnari HQ in a Drukhari detachment. If an Ynnari HQ is in a Drukhari detachment, you can take Drukhari warlord traits. What's the point of both of these rules existing if Ynnari HQs cannot take Drukhari warlord traits? I'm pretty sure its saying accidently exactly that a ynnari hq can take a warlord trait absed on the detachment they take. There is literally no other way for those warlord traits to matter otherwise. Seems simple enough. They are eligible for Warlord Traits, but because they lack the relevant keywords cannot take any <KABAL>, <CULT> or <COVEN> ones. So no trait if your warlord is in a Drukhari detachment. However, if say you take Yvraine in a Craftworlds detachment (warlord) then she can get a warlord trait. You could then take the Yncarne in a Drukahri detachment without missing out. But lets say for example you are like me and you don't like Ynnari and you prefer people to stay loyal to either Craftworlds or Drukhari and not mix both then this is a nerf to Ynnari lists yes? Which is great yes? If you enjoy feeding off the tears of others then yes this is a great day. Especially, I understand, if you wish misery and suffering to Death Guard players. DE WL traits are all keyword ornate, so they cant take them. The DE codex might have been made with Ynnari in mind and this could be a good thing for future development. Yvraine was a Wych before she got religion, no? Giving her a wych warlord trait would be fluffy, if not RAW. Not really. She was actually a captured Autarch pressed into fighting in the arenas. Ah. Shows what I know. Is that in The Fracture of Biel Tan or one of the novels? As far as I can tell the Ynnari 3 don't gain the Keyword of the detachment they're in so the only contentious set of warlord traits is Craftworlds and only because the book doesn't have "Craftworld" in bold to denote a keyword probably because it was the first book.